I shared earlier the first two rows of photos on my office wall. The wall is now complete! I really like it in my office. I know my wife would not want it in the house but that is why it is at the office. Now, when I get a new “Top 20 Photo” I can swap out photos easily without having to worry about matting and framing etc. Just $1.50 at Costco and I can have the new photo on the wall in an hour. The 3/16″ rods do a great job and the little magnetic balls almost look like pushpins but don’t leave a hole in the photo or the wall. I helped my youngest daughter string some twine up on a wall in her room so she could hang photos using miniature clothes pins and decided I wanted to something similar at my office since it will allow me to rotate my photos as I create new favorites and don’t need to worry about matting or framing them. The string and clothes pins seemed a bit too girly so what could I do that would be a bit more rustic or “manly”? I realized I had the little magnet balls that could act as ‘pins’ and just needed something on the wall that they could attach to. I went to the home improvement store and looked around and decided on some 3/16″ metal rods. I could use some hooks to attach them to the wall. I bought a packet of hooks at 2 rods to see how it looked and would come back for another packet of hooks and 2 more rods if I liked it. I am very happy, so will be stopping in to the home improvement store this weekend to buy a second set of rods and add 1 above and one below the current pair. Have always wanted to stop and get some shots of this windmill on SR-26. I like the wooden structure but wish the blades were still attached. 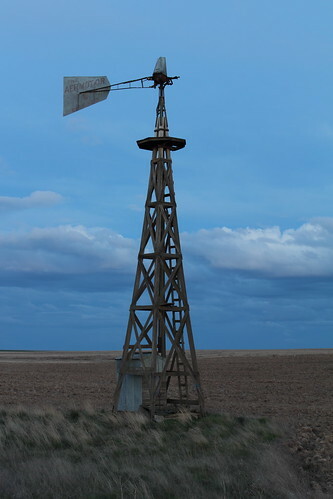 The other windmills along the road have plain metal legs that have no character. Was hoping to get the picture closer to sunset but we were a little too late and the sun set for quite some time. A nice long exposure got the shot but would like a little more color. I may have to come back later in the year when there is a crop in the field and a little earlier in the evening. May also look at some of the other windmills for close-ups of their blades.